Jay McGuiness will reprise his role as Josh Baskin, the role immortalised in the 1998 film by Tom Hanks. McGuiness originated the role in the musical’s UK premiere at the Theatre Royal Plymouth in 2016. Jay came to fame as part of the successful boy band The Wanted. His fame widened when he won Strictly Come Dancing in 2015 with professional dancer Aliona Vilani. He and fellow bandmate Siva won last year’s celebrity version of Channel 4’s Hunted, raising money for Stand Up To Cancer. Jay is also a regular contributor to the BBC’s The One Show and is currently starring in Rip It Up – The 60’s in London’s West End until June. With music by David Shire and lyrics by Richard Maltby, BIG The Musical has a book by John Weidman and direction and choreography by Morgan Young. Associate choreographer is Helen Rymer, musical supervisor Stuart Morley, set and costume designer Simon Higlett, lighting designer Tim Lutkin, video designer Ian Galloway, and sound designers Terry Jardine and Avgoustos Psillas. 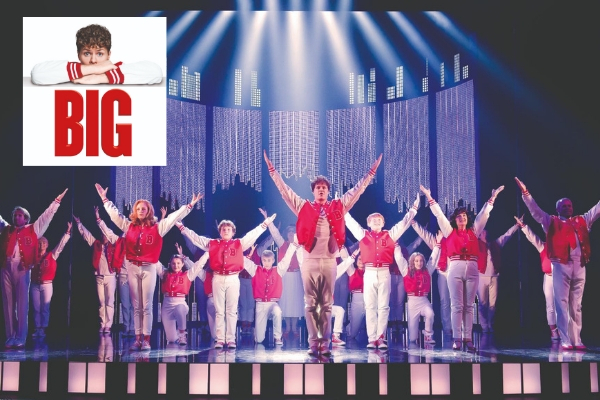 Based on the Twentieth Century Fox Film BIG written by Gary Ross and Ann Spielberg, BIG The Musical will be produced in London by Michael Rose, Damien Sanders and Paul Gregg for Encore Theatre Productions Limited. For more shots from the 2016 run at Theatre Royal Plymouth plus artwork for the West End transfer, see our full gallery on the show's #StageFaves page.